Autumn feasting is very much on the cards for our feathered friends at this time, with many flocks gathering along our hedgerows and trails. Around 30 greenfinches were spotted on the way to Bruaich Hide, stocking up on rose hips. A parcel of 40 linnets and trembling of 15 chaffinches could be seen in fields and by the woodland. Great spotted woodpecker, goldcrests, wrens and robins may be spotted in the woodland on the way to Meida hide. Small numbers of stonechats are seen on the Coastal Trail, often on tops of fence lines. Many of these birds visit this coast over the winter, seeking milder conditions than they’d experience inland. No sightings of twite have been reported, as yet. Waders, ducks and geese are also found in their respective gatherings, sometimes seen taking off together when spooked by a noise or presence of a nearby predator. A kestrel and red kite were spotted over the fields as well as sparrowhawks (both at the visitor centre and woodland). One visitor also saw a distant peregrine, landed out on the sandflat. A whisp of over 60 snipes were seen moving from wetland in front of our visitor centre. Curlews, oystercatchers (like linnets, also known collectively as a parcel) and smaller numbers of other waders (see previous blog) are present on the sandflats. To get the best views, it’s worth coinciding your visit with the high or incoming tides (go to https://tides.willyweather.co.uk/dg/dumfries-and-galloway/mersehead-sands.html). We had 120 lapwings present on the wetland too. 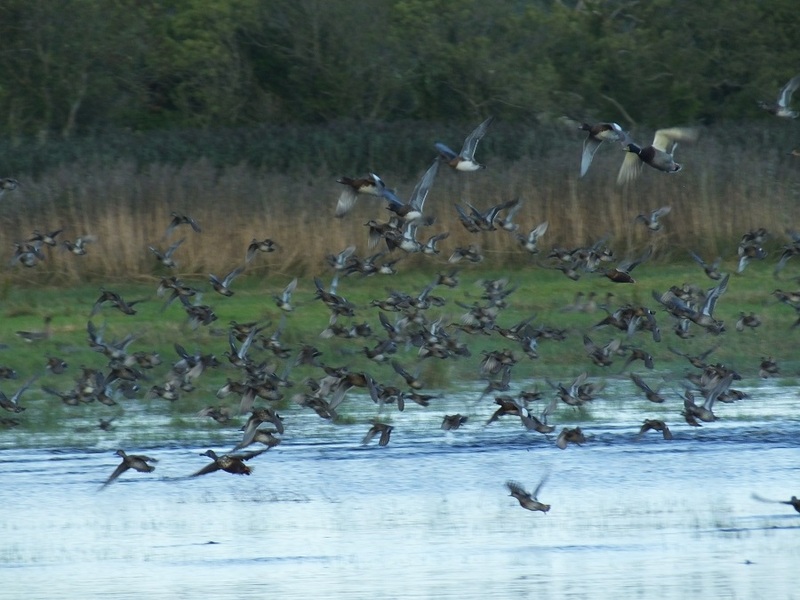 Numbers are gradually increasing for our ducks, with c.50 of shovelers, wigeons and teal. Ten Pintails and an abundance of mallards are also on reserve. If you can find them, 4 tufted ducks and a little grebe have been seen from the hides too. Greylags and pinkfooted geese are still regularly seen on the wetland, with around 50 greylags and over 450 pinkfoots around the reserve. Returning Svalbard barnacle geese numbers rose to 3747 on our bimonthly count on Wednesday, with most feeding in grass fields on West Preston (easternmost part of the reserve). 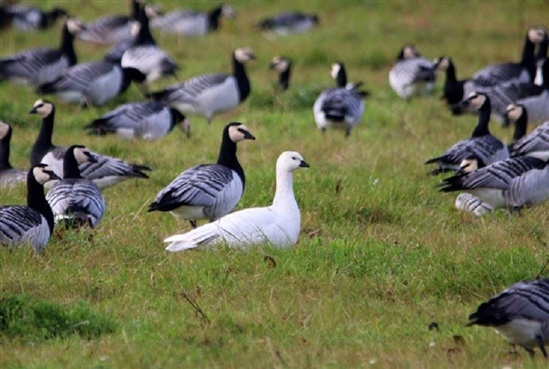 Flocks have been seen feeding in fields near the visitor centre, just behind bird cover. It can be tricky to see them beyond the tall sunflowers now bearing seedheads, but worth checking when you visit the centre. Amongst the flocks arriving at Mersehead this week, one was discovered and photographed by a visitor to be a leucistic form (a genetic trait, where the individual lacks pigment in its skin, feathers or fur (in case of mammals)). Last winter, six leucistics were found in the Svalbard population. We are running the Reserve’s Last Piece in the Jigsaw guided walks, which will offer chances to experience Preston Merse (the new part of this reserve that now links Mersehead with West Preston). Join our walk to see first-hand, the work we’ve been carrying out, learn the story behind this new land and hear how it completes the jigsaw for the reserve. This walk is for the physically fit, as will be quite strenuous and exposed. The event takes place on 16th October and again on 17th November, from 10am to approximately 3pm. Booking is essential, with limited spaces for those wishing to take part. From now through to Xmas, our fortnightly Mersehead Discovery Walk continues. If you’d like to see how we attract nature throughout the seasons and get to discover some of our wildlife close-up, then please do get in touch (booking essential). If looking to brush up on your ducks (and geese) or to get an introduction to bird watching, come along to our What’s That Duck? events on Friday and Monday, 19th and 22nd October. This is a self-lead activity for beginners (of all ages, not just kids), to get people into nature spotting. We’ll provide an activity sheet (with basic duck ID guide) and you can meet our guide in Bruaich Hide, with telescopes and binoculars to help you get close up views of these water birds.